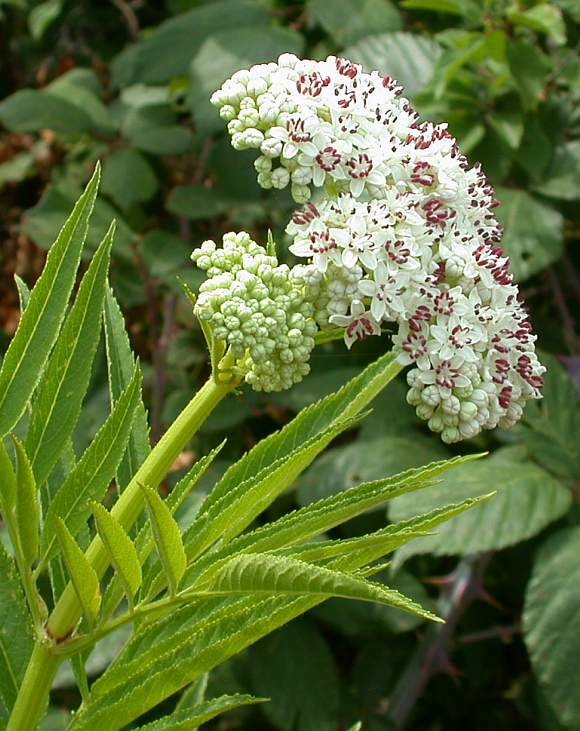 Unlike Elder it isnot a shrub, but rather an un-branched perennial growing to a height of up to 1.5m. Moreover, it dies back in winter unlike Elder . There are more leaflets on a leaf (7 to 13, but it might occasionally have as few as 5) [unlike Elder which has between 5 to 7 leaflets, but might be as low as 3 sometimes]. 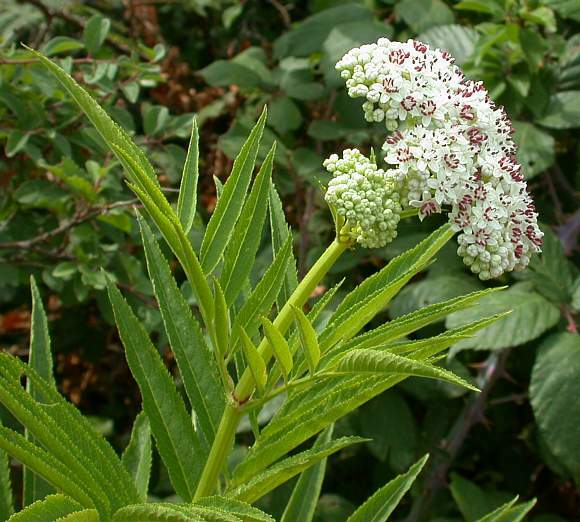 The flowers are white (pink in bud) with 5 petals forming a flattish raceme. Anthers (of which there are 5) are at first pink-purple but later turn brown-black and smaller. Leaves in opposite pairs with many leaflets. There will be more than just one panicle of flowers near the top of each stem, the upper ones opening first. The flowers of this plant really are striking. Your Author is still puzzled by the apparent two differing lengths and colours of the anthers. He wonders is it really just a case of ripe and unripe anthers, or is there more to it the sexuality of this plant than just the absence of styles despite the fact that all(?) flowers are hermaphroditic/bisexual. The filaments are snow-white (concolorous with the petals), knobbly (as if covered in frozen snow) and of an unusually heavy-gauge. Un-opened pods (there is just one in the centre) are pinkish white. Stems are ribbed. There are no styles but each flower is actually hermaphroditic and not wholly male. See text below. In the upper centre are 4 flowers which have now lost their petals and anthers - they have a pinkish flattish top and a developing, pale green at first, berry beneath. The panicle of berries, green un-ripe, beetroot purple in between, black ripe. It looks like the flowering stems go very red when it's in fruit - perhaps to attract the attention of birds to the otherwise ripe black berries. Ripe berries black, others beetroot purple or green. The berries swell up but the scar left by the departed petals remains much the same diameter. Some fruit already gone to the birds. Leaves are pinnate with between 5-13 leaflets and have a foetid smell. Leaflets lanceolate with, somewhat irregularly spaced, forwardly-directed sawtooth-teeth. No relation to : Dwarf Burch (Betula nana), Dwarf Cornel (Cornus suecica), Dwarf Juniper (Juniperus communis ssp. nana), Dwarf Cherry (Prunus cerasus), Dwarf Willow (Salix herbacea), Dwarf Gorse (Ulex minor), Dwarf Cotoneaster (Cotoneaster nanshan) or any other dwarf including the seven so-far un-named ones... [shorter versions of other shrubs with similar names belonging to differing genera]. Apparently, unlike its classmate Elder (Sambusus nigra), it is neither a shrub nor a tree, but rather a deciduous herbacious rhizomatous perennial with no persistent woody stem above ground. It is also an archaeophyte ; been here a while but is not native. The plant has extensive underground rhizomes by which means it spreads. It grows in most types of soil, sandy, loamy or heavy clay and is found growing besides roads, waysides, rough or waste ground. The flowers, although they have 4 or 5 stamens, are without a style, although it has as many stigmas as there are carpels, of which there are 1 to 3. The fruit are black berries, which are violently cathartic if eaten! Other sources say they are not-toxic (maybe they are boiling them first...). So, even without a style, they are still hermaphroditic. 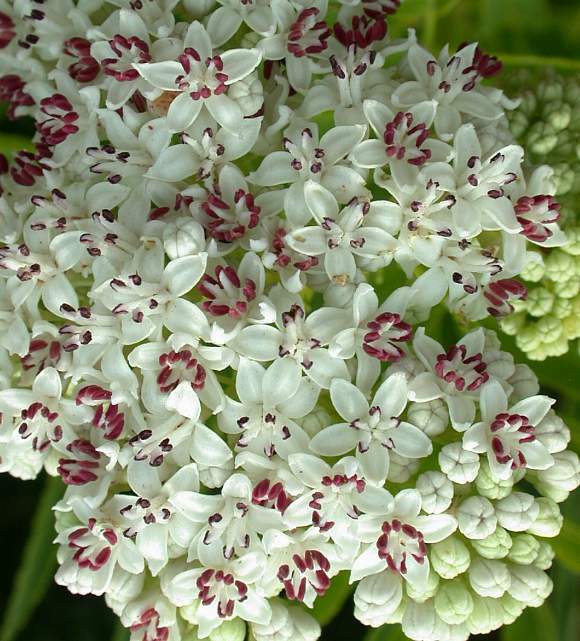 Aromatically, the plant is paradoxical: the flowers are scented, but the leaves smell feotid. The many compounds present contribute to the historically anti-inflammatory properties of Dwarf Elder, but further research is necessary to verify them all and identify all the secondary metabolites responsible, for it has been little studied. Current pharmaceutical studies have revealed anti-inflammatory, anti-rheumatic, anti-nociceptive, anti-haemorrhidal, anti-microbial, anti-parasitic, anti-ulcerogenic and anti-Helicobacter properties. It can also be used to treat burns, infectious wounds, oedema, eczema and urticaria. The berries are toxic when not ripe, but cooking renders them edible. The fruits (berries), when ripe, contain (just traces) of a cyanogenic glycoside called (S)- Sambunigrin , (aka Prunasin or (S)-O-D- GlucoPyranosyl MandeloNitrile ). 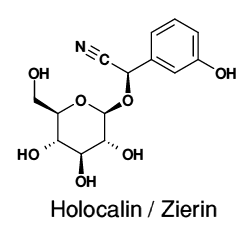 Other cyanogenic glycosides present are (R)- Holocalin and (S)- Zierin (the latter two seem to be identical to your Author, but maybe there is a stereoisomeric difference?). The leaves contain greater concentrations of Sambunigrin. Many RIPs (Ribosome Inactivating Proteins) are enzymes found in Dwarf Elder - such as the type 1 RIP (aka single-chain type) Ebulitin and several type 2 RIPs (with two chains or 4 chains) such as the non-toxic Ebulin 1 and the Nigrin B contained in Elder (which are much less toxic to cells than that most infamous of RIPs Ricin (RIPs of type 3 are only found in grasses belonging to the Poaceae). There are numerous RIPs within Dwarf Elder, such as Ebulin 1, Ebulin r1, Ebulin r2, Ebulin f, SEA and Ebulin blo, but all contain far too many atoms to draw their chemical formulae. The Ebulins are grouped under 'Ebulin'. Lectins, which are proteins which bind sugars, are also found in Dwarf Elder. The biological role of all these proteins within the plant is at present unknown. Ebulin triggers a toxic effect in humans. 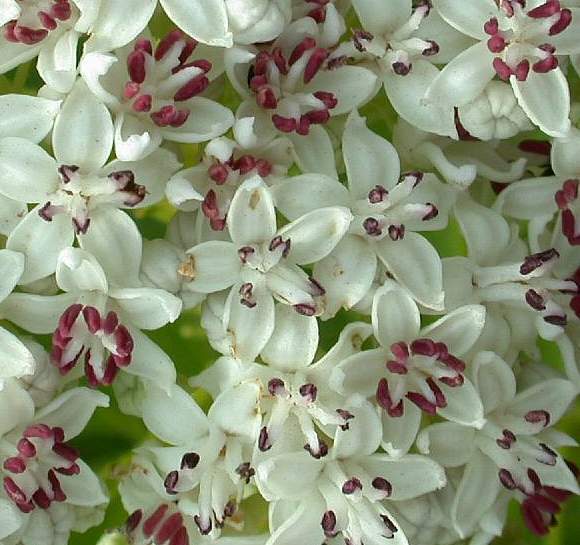 They may represent a new family of allergens which are present in the Sambucus genera. Plants do not normally contain them. They could be involved in the defence of the plant against virii and/or invasive predators, but they do have a nutritional and food-safety impact on the plant. The colours of the fruits are due to several anthocyanidins such as Cyanidin-3-O-Glucoside , Cyanidin-3,5-DiGlucoside , Cyanidin-3-O-GlucoSideoside , Cyanidin-3-O-Sambubioside and Cyanidin-3-O-Sambubioside-5-Glucoside . A blue dye can be extracted from the fruit. The Prunasin may look identical to Sambunigrin , but the former is actually the (S)-(-)-form whereas the latter is the (R)-(-)-form, slightly differing stereoisomers. 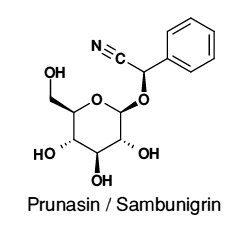 Their differing names reflect the identity of the plants in which they were first found: Prunasin in the Prunus (Rose Family) genus and Sambunigrin in the Sambucus genus. Your Author does not know if the same applies to Holocalin and Zierin, which are also apparently identical between themselves, but may indeed be opposite stereoisomers of each other. What is much clearer is that the latter two differ from the first two by the addition of an -OH on the benzene ring (on the right). 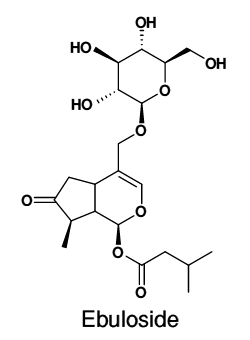 The Iridoid Glycoside Ebulosid / Ebuloside (aka 7-oxo-8-desOxyValerosidatum) is found in Dwarf Elder is also an ester (the methylbutanoate , at the bottom of the diagram). Iridoid Glycosides, such as Ebuloside, are also toxic. Dwarf Elder also contains another Glycoside: Morroniside (a seco-iridoid or pyranopyran which is actually another iridoid) is also found in both Japanese Cornelian Cherry (Cornus officinalis), a non-native shrub, and in Morrow's Honeysuckle (Lonicera morrowii) another non-native. 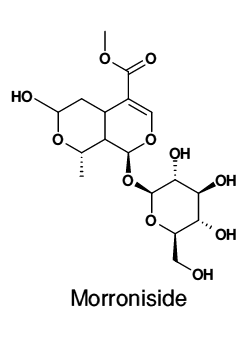 Both Ebuloside and Morroniside are related to Loganin.